When you interact with a serialized item, Ascend is typically going to urge you to get that serial number in your system, in your Sale, and in the Work Order to make tracking the product as easy as possible. But for some situations and systems you might have in your shop, that might not be convenient for you. So if you're a manager or store owner, you can choose to disable these prompts. 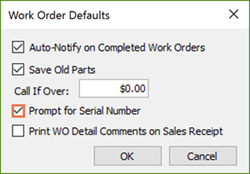 Uncheck the Prompt for Serial Number box in Work Order Defaults in Options. To get there, select Options > Sales and Returns > Defaults under Work Orders. This box is checked by default, but you can uncheck it and select OK, followed by Apply or OK in Options. 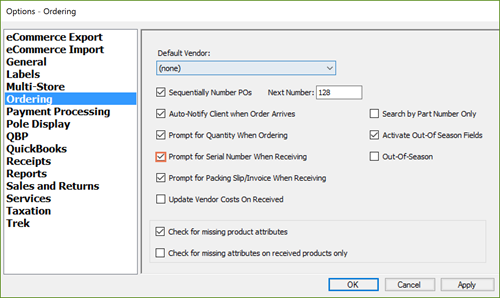 Uncheck the Prompt for Serial Number when Receiving box in Options. To get there, select Options > Ordering. This box is checked by default, but you can uncheck it and select Apply or OK to save your changes. It's important that bikes are registered to the customer at time of sale. This helps your shop know the history of the bike over time, and makes it easier to track if it's ever lost or stolen. If someone is buying a bike as a gift, and you don't want the Trek registration information to be emailed and "spoil the surprise", leave the sale open as a layaway until after the gift-giving date. The registration email won't send until the sale has officially been closed in Ascend.